Describe – A First Look! This is a very exciting week in Describe-land! This week, I’ll be making the full instructions available and even an unveiling video from when I opened the very first copy! I’m very excited to be sharing this with you as I have worked on it for several years. Here is the very first copy ever printed right after I opened it; hot off the presses! I’m looking forward to showing you what’s inside! 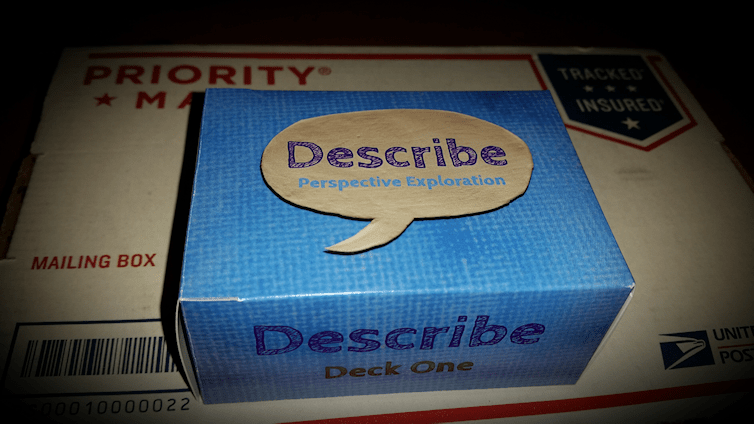 Describe – A deck of over 100 cards that increase understanding between human beings. Stay tuned for more information this week! And don’t forget to spread the word to increase your chances of winning a free copy!